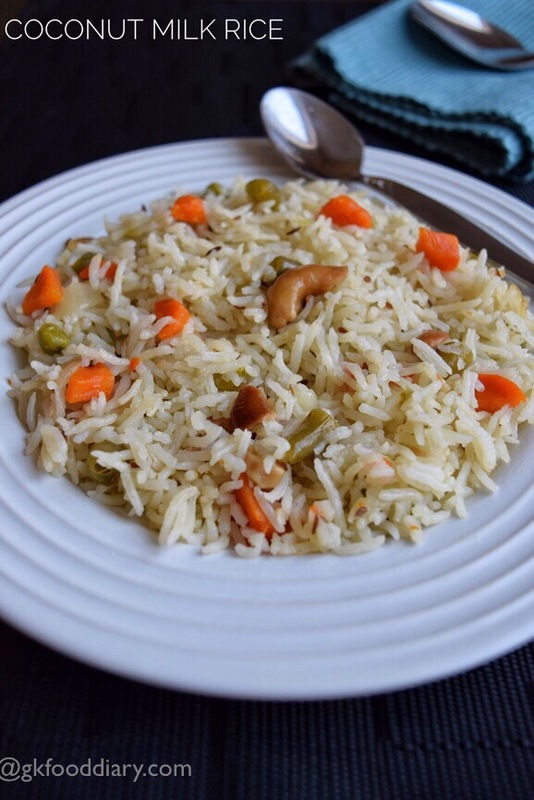 Coconut Milk Rice/Thengai Pal Sadam – a mild flavored rice with coconut milk,cashews, ghee and tempering. Coconut milk is known for its health benefits, including it regularly in kids diet is a good way to improve their bone strength and immunity to fight diseases. 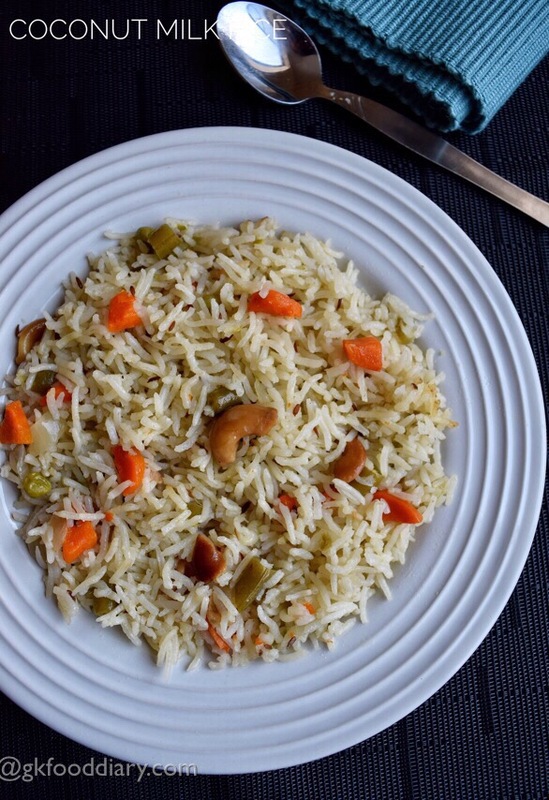 This rice is one of the tasty and healthy rice variety which is just apt for kids. 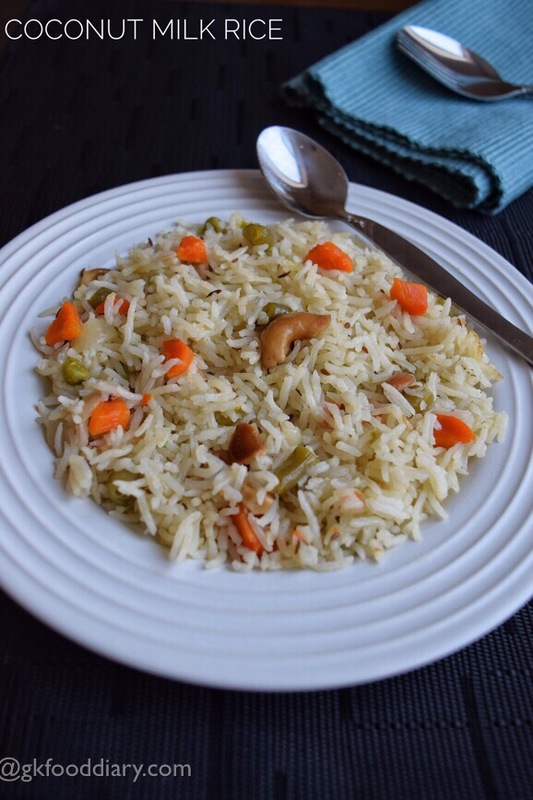 Adding vegetables to coconut milk rice is totally optional, it tastes great even plain but I have added assorted vegetables to make it more nutrient rich. 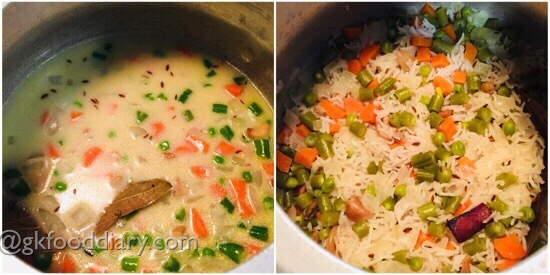 You can simply serve this coconut milk rice with curd or any vegetable curry of your choice. Coconut milk rice can be given to babies from 10 months once they start eating all family foods. 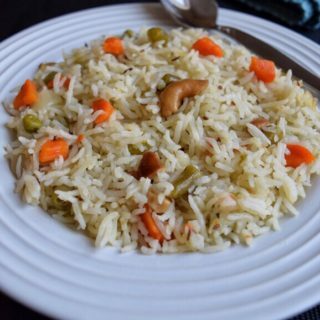 Here is how to make easy coconut milk rice recipe for babies, toddlers and kids. 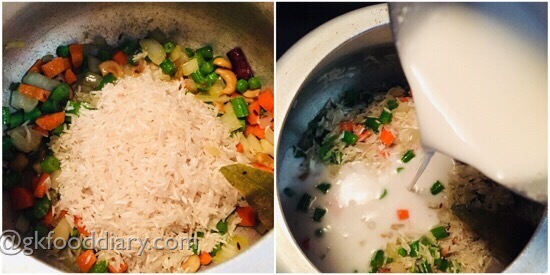 Coconut Milk Rice- A one pot meal made with rice,coconut milk and ghee. Nutritious lunch/dinner for kids. Extract coconut milk from grated coconut. Wash and chop all vegetables(if using) into cubes. Slice onions finely. Slit green chilies. Set aside. Wash rice in running water 2-3 times and soak it in water for 20 minutes. Heat a pressure cooker with ghee. 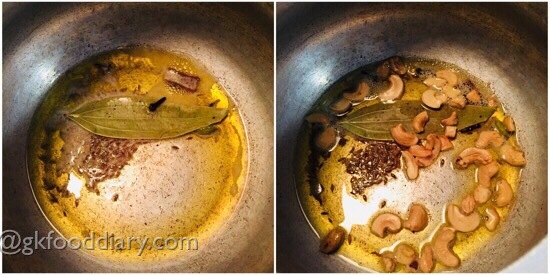 Add bay leaves,cloves, cinnamon and cumin seeds. Let cumin seeds crackle. 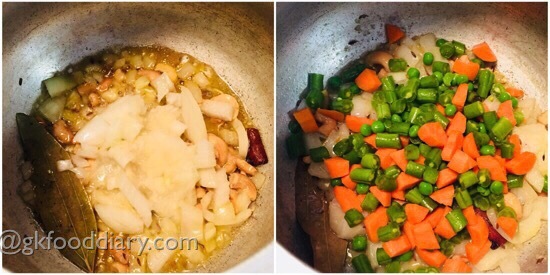 Then add cashews and fry them until golden brown. Now add in chopped onions along with ginger garlic paste & green chilli. Saute them nicely until golden brown.Once onions becomes transparent , add chopped vegetables and toss them nicely for 3 minutes. Add soaked rice and give a quick stir. Then add coconut milk. Mix well, add required salt at this stage. Bring it to a boil. Then close the lid of pressure cooker and cook everything in a medium flame for three whistles. Once the pressure releases, open the cooker and fluff the rice with a spoon slowly, top with more ghee if required. 1. 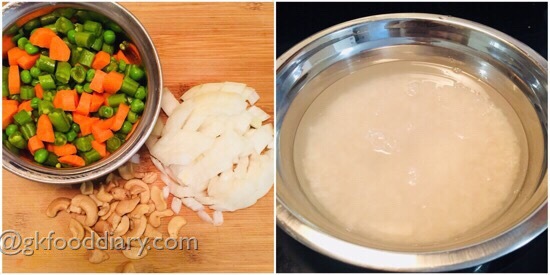 Extract coconut milk from grated coconut. Wash and chop all vegetables(if using) into cubes. Slice onions finely. Slit green chilies. Set aside. Wash rice in running water 2-3 times and soak it in water for 20 minutes. 1. Heat a pressure cooker with ghee. Add bay leaves,cloves, cinnamon and cumin seeds. Let cumin seeds crackle. Then add cashews and fry them until golden brown. 2. Now add in chopped onions along with ginger garlic paste & green chilli. Saute them nicely until golden brown.Once onions becomes transparent , add chopped vegetables and toss them nicely for 3 minutes. 3. Add soaked rice and give a quick stir. Then add coconut milk. 4. Mix well, add required salt at this stage. Bring it to a boil. Then close the lid of pressure cooker and cook everything in a medium flame for three whistles. Once the pressure releases, open the cooker and fluff the rice with a spoon slowly, top with more ghee if required. Coconut milk rice is ready! For small babies, add 1/2 cup of extra water along with coconut milk to make the rice little mushy. 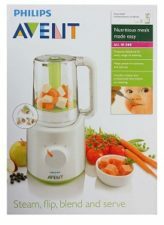 Mash it well and feed your baby. Also avoid whole cashews. You could use store bought coconut milk as well but freshly extracted coconut milk is recommended for babies. Big onions can be replaced with 10 Small onions/shallots for a different flavor and taste. You can also add a handful of mint or coriander leaves. Adding vegetables to this rice is totally optional. Skip green chilies for small babies. 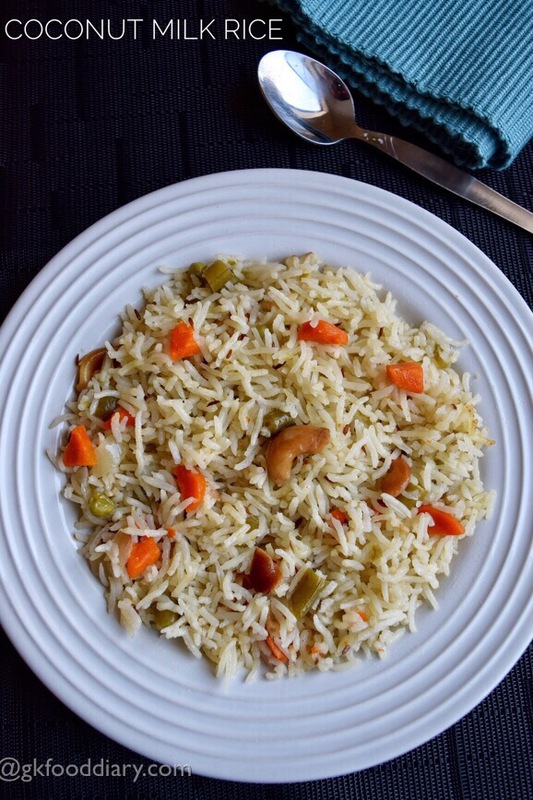 Any Normal cooking rice can be used to prepare this coconut milk rice. Water quantity depends on the type of rice used. I have used basmati rice and hence 1.5 cups of coconut milk is apt with prior soaking. Adjust green chilli according to your preference.